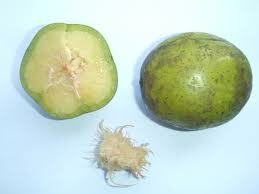 Ambarella is a fruit of South and South-East Asia. From there, it spread to other tropical parts of the world. 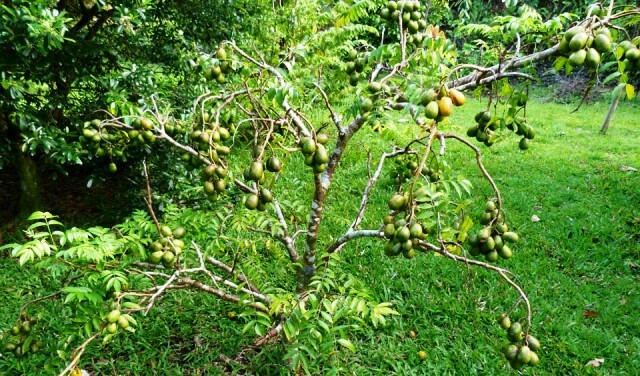 It is a quite common tree in the home gardens in South East Asian countries. The green as well as ripe fruits of amabarella are used in a variety of ways. A large, sometimes buttressed tree, 25-45 m tall, trunk 45-90cm in diameter; bark shallowly fissured, grayish to reddish-brown. 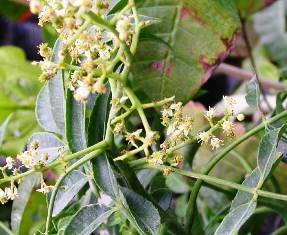 Leaves with 4-10 pairs of leaflets, rachis 11-20 cm long, petiole 9-15 cm; leaflets ovate-oblong to lanceolate, 5-15 cm x1.5-5 cm, chartaceous, unequal at base; margin entire, serrate or crenulate; apex acuminate. Inflorescences paniculate, terminal, usually appearing before the leaves, up to 35 cm long; flowers cream to white, pedicel 1-4 mm long; calyx lodes triangular, 0.5 mm long; petals ovate-oblong, about 2.5 cm x 1 cm. Fruit an ellipsoid or globose drupe, 4-10 cm x 3-8 cm, bright-orange; endocarp peculiar, with irregular spiny and fibrous protuberances. There is a large variation and the fruit quality varies from tree to tree. The fruit from the best tress is eaten raw. Fruit from relatively less good types is stewed and used for jams, jellies and juice. Fruit can be stored for several months after it is boiled and then dried. The fruit has a leathery stone which is ridged and bears hard fibres that project into the flesh. When green the fruit is crisp and sub-acid; as the fruit ripens (on the tree or after harvest) to a yellow colour, the flesh softens, the flavour changes and the fibres become more noticeable. Unripe fruit is much used in green salads and curries and for making pickles. Young steamed leaves are eaten as a vegetable. The fruit is fed to pigs and the leaves are eaten by cattle. 100 g edible portion the fruit contains, water 60-85 g, protein 0.5-0.8 g, fat 0.3-1.8 g, sucrose 8-10.5 g, fibre 0.85-3.6 g. Ambarella is a good source of vitamin C and iron. Unripe it contains about 10% pectin. The wood is light-brown and buoyant, useless as timber, sometimes used for canoes. There are diverse medicinal uses of fruit, leaves and bark in different parts of the world, the treatment of wounds, sores and burns being reported from several countries. Ambarella is a prolific bearer. The tree grows and start bearing quickly. Even the seedlings start bearing fruits within 4 years of planting. The fruiting is almost all the year round under humid tropic conditions. 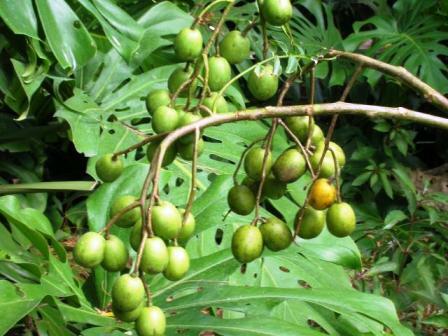 Ambarella can be grown in the warm subtropics as well as the tropics. It is slightly less hardy than the mango. The trees require much light; shaded trees produce little or no fruit. Sheltered locations are advised, as the brittle branches break easily. The trees are drought-tolerant; under stress they may briefly lose their leaves. Ambarella grows on limestone soils as well as on acid sands, but the soil should be well drained. Ambarella is often propagated from seed, which starts to germinate within one month. However, clonal propagation of superior trees is recommended. and not difficult:. This can be done by cuttings, air layering and even grafting. For commercial plantings a spacing of 7.5 m to 12 m is recommended. Trees are prolific and respond to care (water, nutrients) but there is no information on growing techniques or yield levels.